The author analyses the grammatical means of encoding static location as well as direction and manner of motion in Kuwaatay, an Atlantic language of Senegal, which is hitherto not described. Klaudia Dombrowsky-Hahn makes an important contribution to the discussion on how motion events are represented in serializing languages. It is unique to Kar (and few other languages) that the number of ground NPs per serial verb construction may not exceed one. Ursula Drolc’s unfinished paper provides the first data on motion expressions in the Atlantic language Laala. Axel Fleisch investigates the diverse functions of orientational clitics in his contribution on Tashelhit Berber. He also discusses in detail the arguments which can be brought forward for categorising Tashelhit Berber as a verb-framing or satellite-framing language. Debela Goshu focuses on the semantic component path in the Cushitic language Oromo. Although path is commonly lexicalized in the verb root, Oromo also shares features with satellite-framing languages: the preverbs of Oromo, in particular, are reminiscent of those found in Indo-European languages. The joint paper of Beatrix von Heyking and Anne Storch takes a look at motion constructions in the Nilotic languages Luwo and Belanda Boor in comparison to closely related languages. The derivational ventive and itive morphemes are petrified in Luwo and Belanda Boor. Instead, these and other path configurations are encoded outside the verb, through prepositions and particles. Manner of motion is expressed in an amazingly high number of very specific ideophones. After an examination of which semantic components are conflated in motion verbs, Angelika Jakobi concludes that the Saharan language Beria is a verb-framing language. She disentangles the suppletive paradigm of the verbs ‘go’ and is able to show that the verb ‘come’ is an amalgam of the verb ‘go’ and a ventive morpheme. Ronny Meyer analyses the lexicalisation patterns of motion verbs in the Ethiosemitic language Muher. After a general discussion on how objects are encoded and how verb valency can be determined in Muher, he argues that Muher motion verbs are monovalent and that the goal NP does not have the status of a core argument. 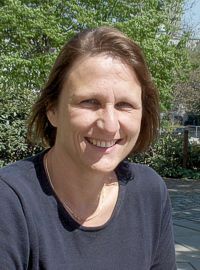 Based on data from frog stories and questionnaires, Angelika Mietzner sketches the grammatical features of constructions encoding topological relations in the Nilotic language Keyo and shows, in particular, which type of topological relation between figure and ground triggers the use of which postnominal modifiers and which position or caused position verbs. In her contribution on the Ubangi language Zande, Helma Pasch proposes to arrange location and motion constructions on a scale of increasing syntactic complexity. In the section on motion constructions, she analyses, among others, the preposition ku ‘to(wards)’ and shows that this morpheme is not only used with motion verbs but also found in one particular type of (static) location construction. 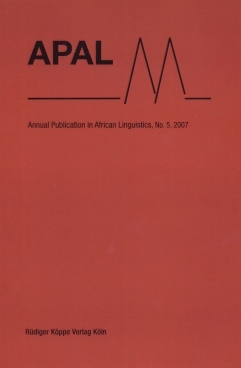 Frank Seidel’s contribution focuses on the functions of the distal marker -ka- in Yeyi. He proves that, in Yeyi, the morpheme signals motion at a place distant from the deictic centre (i.e. altrilocality) rather than movement towards a distant place. Yvonne Treis emphasizes the important contribution of case morphology on ground nouns for the encoding of path in the Cushitic language Kambaata. Kambaata does not favour the semantic component manner being mapped onto the main verb. The more manner-specific a Kambaata verb is the more likely that it will occur as a subordinate verb. Christine Waag examines the lexicalisation patterns in the predominately verb-framing language Fur, a Nilo-Saharan language. The author illustrates that the addition of a relational noun (e.g. ‘inside’) to a locative argument may change the semantic role that the verb assigned to the latter.